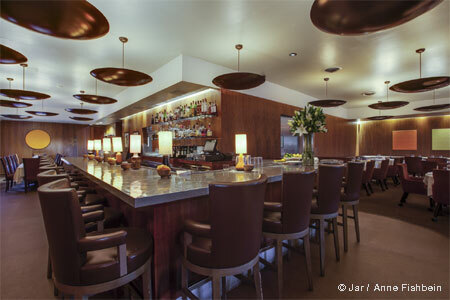 Mister O’s offers “modern Angeleno cuisine” in a mid-century styled dining room in Studio City. : Prolific restaurateur Michael Cardenas (Sushi Roku, Lazy Ox) is behind Mister O’s in Studio City. Chef Mario Alberto (Lazy Ox, Ysabel) creates bright, “modern Angeleno cuisine” with light dishes like avocado with salt cod and lemon balm or fried turmeric bread with tiger figs, olives, farmer’s cheese and honey; mains run from sea bass with chanterelles and corn to lamb loin with sunchokes and côte de boeuf. The bar program from Rafael Jonathan Barba (The Restaurant at Meadowood) is sophisticated, and the wine and beer lists are compelling. 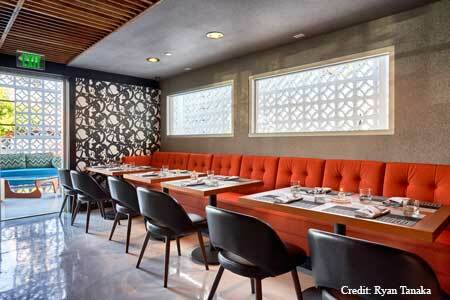 The airy, mid-century styled dining room and lounge have an elegantly casual California vibe.